LOCKLINE2019. Refugees in Athens, Arash and Zarah, whose lives and future are at stake find numerous ways to support each other and rise up in creative ways. My name is Alexander Moust and along with my team, we would like to involve you in our film project JUST PEOPLE about an interesting group of people and a very topical subject that definitely deserves your attention. The humanitarian crisis and refugee flow that has arisen in Europe as a result of the war in Syria and against IS leads to inhumane situations for a lot of innocent refugees on the mainland and the islands of Greece. Arash Hampay - Just People - from moonfilm on Vimeo. In order not to look away from the issues myself, but to pay attention to the extremely distressing situation of many, I have repeatedly traveled to Greece and the Balkan countries, filming there and talking extensively with refugees in the least pleasant circumstances. I also maintain regular contact with them. As a team we need to go back and shoot again for 2 weeks a.s.a.p. to show the curent situation in Athens. Our cameras and microphones take us into the lives of the main characters, Arash and Zharaa, young, determined refugees from Iran and Syria living in Athens. We come to places and situations where as an outsider you normally do not know about and we become part of the daily life of the refugees. In addition, I let them express themselves and ask questions that appeal to their inner world. There is a clear distance between what they want and the possibilities given to them in reality. But they are strong and hopeful and I feel, they will make it. - Zharaa turns 18 in the film and is full of her mate, a boy who gives acting lessons. Her older sister works as a translator, her younger sisters want to become dancers or lawyers. Her father has become blind during the war in Syria. Zahra and her family wish to get him an eye operation. What will their plan be if, hopefully, they all get a passport over the summer? - Arash (33) feeds hundreds of homeless people every day through his 'Our House' initiative. But can he also reunite with his younger brother who was not granted asylum in Greece and is still stuck on Lesvos? Both of them wish to speak their minds and show us their (inner)worlds. 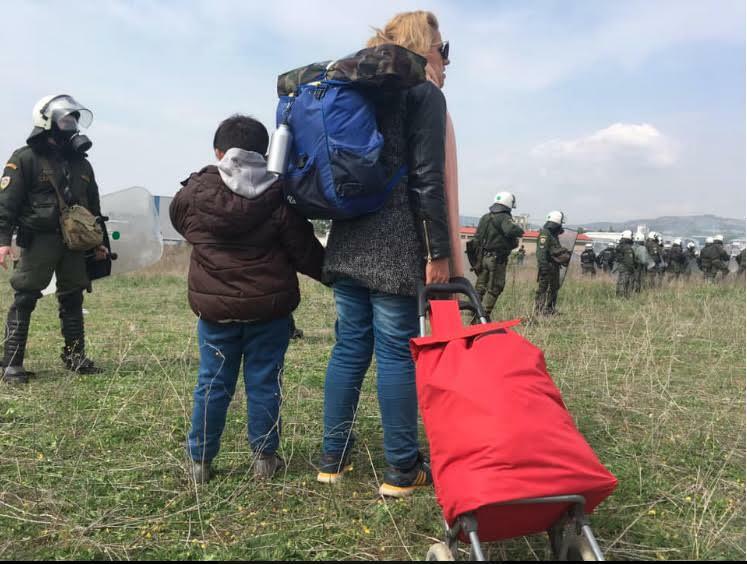 The situation for the main characters has become very critical now that the Greek authorities are cutting off the flow of money to these extremely vulnerable people and many are being evicted from their homes. The date that this will start to happen on a large scale is around April 1, 2019. How do Zharaa and Arash cope with that? As journalists and filmmakers, we have to start shooting this film NOW. Because we are also active via social media, we try to keep you and the media informed with the film and the images from behind the scenes. We are there when this precarious situation is likely to get out of hand. By following Arash and Zharaa in their activities through everyday scenes, with family, alone, on the street, in soup kitchens and at jobs in refugee initiatives, cultural, educational or political activities, we get a good picture of them. Their voices or comments ensure that at the same time we hear their inner thoughts about their new temporary and uncertain home situation. By editing video image, photos, sound, and animation, the alienating, the uprooted and inhumane become tangible for the viewer. We hear their interior monologues (their inner thoughts) auditory under an everyday scene, and a moment later they speak directly to us, straight into the lens. Their dilemmas, the psychological tensions, become palpable. We meet other refugees sideways or introduce these briefly in the streets, against a backdrop of graffiti and staring into our camera. The lively streets full of graffiti are in stark contrast to the stateless or lawless refugee, who is in danger of becoming a shadow of himself in this setting. I want to get close to their skin through direct cinema or cinema verité, and with that get closer to their emotional world and inner human reality and dignity. I put each other's humanity first and approach them with genuine interest and attention for who they really are or desire to be. No numbers, but just people like anyone else.
" For the time being these people are stuck here, but together they visibly have enormous potential and talent. How do I bring that to life creatively? ", I said to myself. In addition, I integrated a photo project into the entire film concept, so that refugees themselves can actively participate in the process of image making. With a high-resolution digital photo camera, I will create situations in which they and I will portray refugees together. This can lead to an (open air) exhibition and/or a book. This sub-project is about the subculture of the refugees in Athens. The main characters in this film love this idea. Both Arash and Zahra prefer to be or become a photographer or journalist. The film and the Just People project offer them a voice, an expression form and a platform for ventilating the thoughts that many refugees like them share. So, photos from our work together will be integrated into the film itself. Some are confident, feel that there is a future and want to build towards it. Others have almost lost hope, due to a number of setbacks and the vicious circle of daily life, and the relentless political unwillingness to accept them. In short: all setbacks that overpowered them and their position in society in Greece as "outcasts" will take their toll over time. Opposite feelings of powerlessness, we portray two powerful characters, Arash and Zahra, who independently live towards achieving their dream. In this, they show enormous strength, creativity, and perseverance. In conversation with them, concepts such as freedom, humanity, solidarity, and justice were repeatedly mentioned. They yearn for that recognition, for a real future, for certainty, for warmth, care, and love. Very normal and elementary things in any human life. You can help us - and the people represented in this film – enormously. You can really make yourself a vital part of the creative process through your donation. You can share the 'behind the scenes' material yourself and expect that we will try our utmost to show the film in full at festivals or on TV. Your name will be added to the credits. Through donations, you can obtain pre-premiere tickets, but you can also opt for lateral support of the various aid projects or people appearing in the film. This film, therefore, has clear journalistic characteristics, but also an important social and artistic objective. Kindly, take a look in the right column section for all 'reward' options. We will have a festive film premiere in the summer of 2019 in a weekend or holiday. Location (kept secret for now): an attractive, hip cinema, with a fine restaurant, a funky bar in a prime location in Amsterdam with free parking & a stunning view from the terrace. Sorry, it doesn't get any better than this. An ideal opportunity to exchange ideas. Support this project repeatedly by sharing the links to this crowdfunding project on your social media pages or via WhatsApp on your mobile. For this film, we will collaborate with a host of other professionals who will take on part of the process. Until now, we have invested mainly our own time and money, loads of it. But we need to, seen the circumstances, find other means of financing, such as crowdfunding here. Much depends on the efficiency we have in and around Athens during the shooting days and on the trust and contact with refugees. Their life, however, is not like yours and ours and we always have to be patient. Above all, we feel that this film should be made NOW because the pressure on these people is going to be huge by April/May 2019, since the political debate turned them a blind eye, and the intention of the Greek government to keep these people out on the streets and/or financially without support is about to hit all of them. This may lead to chaos. You are of vital importance in the realization of this project. Because of its -approximately- 1 hour duration, the film will fit into TV slots or film festivals. Being active on Social Media is key to its success and you can help spread the word! For over a decade we have been a production house as filmmakers/producers and we work for and with amongst others, NTR and also make all kinds of commissioned films. Alexander also writes about (documentary) film and photography on various forums and in magazines. He is a gifted interviewer, photographer, and director. "Arash and Zahraa are wonderful people, and I am glad that I have found them and they have found me. They deserve to be heard and seen and not to soley act as a channel for food and help to others or as an information point for the press. In my opinion, Just People is an opportunity to give and exchange each other's human side. We are setting up www.justpeoplefilms.com - which will assemble work from artists and musicians, so they can actually reach out to a wide audience and live from their artwork or music. I hope, I can continue to communicate with them for a long time and work on something good. " '' I vividly remember the recording stages of a similar project in Santa Domingo, Dominican Republic, where we worked with homeless or neglected children. None of them were attending school. That project aimed to show them a goal in life by teaching them crafts that they could later carry out with their own hands. Practicing a profession. Learning to create a home for themselves and their family, relatives or friends. "This film, JUST PEOPLE, allows us to continue to work in a similar way, more professionally and even add animation to the sequences. This film can also be viewed better worldwide thanks to the internet and social media. " "It is also paramount that Arash and Zahra themselves are very generous, intelligent and righteous people. Being able to exchange ideas with them about their situation is a privilege and is 100% sincere from both sides. " Lucienne teaches Documentary filmmaking at various film and photo-art colleges. She was co-directing the series: Familie, Geloof en Hoop. She is a professional editor and can work through intuition and is a true asset as it comes down to finding the essence in a scene (where every now and then, as a director/cameraman, this gets blurred for me). Together, we discuss scene selections and dramatic development. Later after she has edited certain episodes, I can easily find music, sounds or animations to it. It is a wonderful way of assembling meaning in editing, so to speak. We have both made documentaries on similar topics before separate from one another. Your joint support helps to put these life-threatening, often inhumane situations on the agenda again, in which many innocent people live in and around Greece. This is, of course, a matter that concerns the whole of Europe. So foreign parties are also more than welcome. For the final cinema release, we do not shy away from co-productions in areas such as post-production of sound design, color grading, and of course animations and graphics. Looking forward to seeing your documentary! Klasse Alexander. Mooi project. Succes ermee, ga door hoor! Arash is een hero. 'Gewoon doen', daar hou ik van. Succes, Alexander en Lucienne! Tijdens de WGZH reis heb ik Arash en Zharaa mogen ontmoeten en ben ik onder de indruk geraakt van hun moed en doorzettingsvermogen. Kostbare mensen! Benieuwd naar jullie film. Heel veel succes met het maken van de film. Heb je gesproken in Athene met kerst WGZH. Respect dat je dit voor het voetlicht gaat brengen doormiddel van deze film/documentaire. Succes! Ik ben heel benieuwd naar het resultaat. Jouw film is hard nodig! Wow, what an important update you have added today! It shows how much urgency lies in the topic you have in Greece as a whole and not in Athens only...Hoping you will be able to create the film soon. En tant que présidente de Choosehumanity, une organisation active à Chios depuis 3 ans, je soutiens ce projet pour plusieurs raisons : d'abord, je connais Alexanders et Arash, je sais donc le sérieux du projet. Ensuite parce que ce projet met en évidence la résilience des réfugiés et leurs capacités de rebondir. Finalement, parce que ce film permet de prendre conscience de la solidarité qui existe au sein d'une population qui n'est pas privilégiée. Que ceux qui le sont fassent preuve de solidarité aussi ! Veel succes met de realisatie van jullie mooie project! Dear people and supporters of Just People. Last few days around 11th of April, Arash helped to shelter many families and single people evicted from their homes in squats. Besides that he is feeding hundreds on the streets. This videoclip is what I shot with Arash and the Athens situation is becoming even more urgent. That night we helped an Afghan family to a squat and they were able to stay there for only 2 days. After that Hilda Orr helped out for another two days (you can hear her voice and speaking to Arash in Victoria square). Kindly share and donate to the filmproject with others. It will help all of the people in the film and on the streets of Athens. We will try to create a world audience and raise more awareness for this issue, so if you can: share this-support this. Beste mensen en supporters van Just People. De laatste paar dagen hielp Arash veel gezinnen en alleenstaanden te beschermen, nadat ze uit hun kraakpanden op straat werden gezet door de politie. Daarnaast voedt hij honderden op straat. Deze videoclip is wat ik met Arash heb opgenomen en de situatie in Athene wordt nog urgenter. De avond dat we hier op Vidtoriaplein waren wisten we met hulp van Zharaa en haar zusje, een dakloze familie onderdak te bieden voor 2 nachten, daarna hielp Hilda Orr (spreekt tegen Arash in de video) hen ook voor 2 nachten. Vervolgens werd de bestemming kamp Malaksa voor hen, ver buiten Athene. Deel ajb en doneer aan dit filmproject met anderen. Het zal alle mensen in de film en op de straten van Athene helpen. We zullen proberen een wereldpubliek te creëren en meer bewustzijn voor dit probleem te creëren, dus als je kunt: deel dit - steun dit. Dank. Today we received news from one of our main characters, Arash sent us photos and videos of collisions with the Greek police forces. Hundreds of refugees were trying to cross the border. Also from the (northern) Macedonian border we have received the same news. We will not show you all these images here to respect the privacy of the people who are in them. There was some fighting, teargas and a lot of frustration among men, woman and children. Refugees had gathered, as they believed the borders would open for them. Arash has warned them that this was a false rumour. He has said to me he would be back in Athens in a few days. This is a highly delicate situation. It shows how desperate these vulnerable people have become. Our House, the project Arash is serving (which means serving food to the homeless) estimates that 2000 people have gathered in Thessaloniki. He will try to feed all of them and has requested donations online in order to fulfill his task. Athough this is not the main topic of JUST PEOPLE it shows how desperate the lives of these people can get. And what are they to expect in the future? We believe that they deserve to be heard and that their requests should be taken seriously fully. A.s.a.p. We love you..this gives us strength to start. We'll send you all info and several updates about our shooting and premiere event via email with a personal thank you. Spartans! : Your are buying your online-filmlink . The link will be active on the premiere night. Everyone who buys a cinema or online ticket will receive updates before and after the screening. Even if you cannot make it to the screening while you're hiking across Nepal or Machu Picchu: You're still in! Early Bird - we'll update you on the premiere event, and also put you in the credits of our film. You are getting your ticket to the screening. 2 special 'Early Bird' tickets! Sure...we'll keep you updated on the premiere date and venue. (Dress sharp;) You are on the credits with a 'special thanks to you two! You'll get 'behind the scenes footage' regularly. Superb! We offer/send you a signed -specially for you- high resolution photo print by the makers or characters. (A4-size) of the poster of JUST PEOPLE or one of the protagonists of the film. You are Serious! Okay...2 tickets in a love seat (if you like it or not), special behind the scenes footage, updates on premiere event and attending artists and a DVD/USB of the film. Credits: We lovebirds adore 'Just People' You got it! You have 'a special card' a) JUST PEOPLE t-shirt designed by the people featuring in this film b) direct SUPPORT to one of the 3 projects mentioned in the description. And you can expect all of the aforementioned..yes!.. Including the 2 love seat tickets?.. You got 'm! Say cheese! MEET THE MAKERS & PRODUCERS in The Netherlands or Belgium for a coffee/luch or have a virtual session via skype with us where you can ask all about our experiences and the lessons we've learned. We will answer all your questions to the best of our abilities. You will also get the hidden online link or a DVD/USB (your choice). This option is also valid after the premiere event. We love to meet YOU! You won't give NO for an answer, correct? Alright, how can we help? -4 tickets (2 x 2 loveseats), -4 t-shirts designed and printed by a refugee artist from Athens. - And you get to decide which image of her/his should be printed. So, you support that artist's work an life. You'll receive all of the above..you're in! Mamma mia..! You will receive a Skype conversation with the director and a main character from Amsterdam (editing) or Athens (shooting). We will give insightful comments on the film. (language options: En/Fr/Du/Ge) You will receive a unique photo still from the film or a portrait of your choice from the photo project. Obviously you will be informed, and receive 6 cinema tickets and a DVD/USB. We'll fix it! All rewards from 500 euros and higher will receive a logo in the credits : made possible with the support of. Fine arts loving creature..! You are supporting an animated sequence where a character in the film speaks his mind. This is a donation where we will look for a proper style to portray the feeling and thoughts of a special person, a refugee. You will be welcomed as (a) special guest(s) at the premiere event and screening. 2 tickets or (love) seats. Plus extra special footage for you too. You got 'm! We are speechless! We offer/send you a high resolution photo print (A2-size) of the poster of JUST PEOPLE or one of the protagonists of the film, which he or she will sign for you. You select the picture! Sure you get the bests seats at the first screening + all of the above. Bammmmmm! You've nailed it...this is more than anything we had ever hoped for and YOU just, did it for JUST PEOPLE I guess you are: a) A Film Lover of the purest kind b) A Human creature with immense empathy How can we reward you? PS: you are on the credits with a logo or name on the WE WRAPPED 'JUST PEOPLE ' And you have a bundle of tickets for the screening in your hand.